When you get injured it stops your training. Our experts define the causes so we can use the best therapy tools and give your the right recommendations. Our plan involves manual therapy, exercise and movement coaching which will take away your fear and get you back to your training. When your training stops progressing it gets frustrating. Our experts ask better questions to reveal your limitations with your body or your training. We create a plan to fix your deficiencies, give you strategies to succeed and take you to the next level of your training. We must first make sure your joints have the requisite range of motion needed for the movements that you go through in your training. We teach you about where your movement faults are in your technique. Then we give you cues on how to correct those movements. We give you training recommendations to modify your workouts. Some movements, depths and scaling options are safer than others. We will also communicate with your trainer. Lori has accepted the position is as the Lead Physiotherapist for the Canadian Women Rugby 7s team. Lori will be relocating to Victoria, BC to continue her performance therapy work with the reigning 2016 Women's Rugby 7 bronze medalists. Lori will be missed. I have worked with Lori for almost 5 years now and it has been a pleasure. Lori always did great work with her patients and exemplified our Performance Therapy approach. Her unique skill set as Physio and Strength coach will be missed. She had a great clinical mind and is a great athlete. One of my fondest memories is when we were training together doing box jumps and she was hanging with all the boys. She could get up there. She easily box jump 40”. OHFAST is world class. 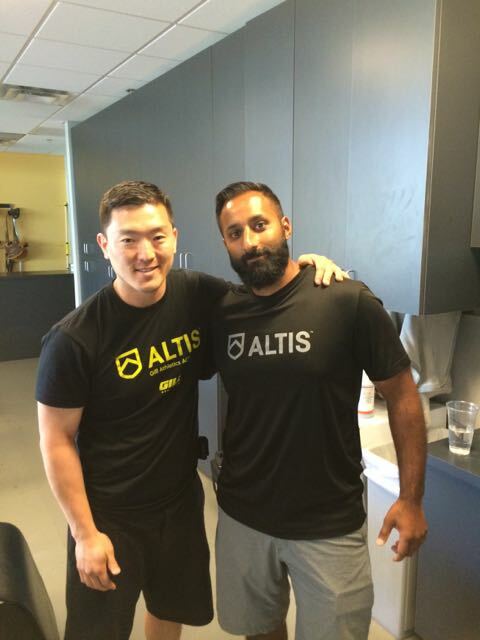 Congrats to former OHFAST performance therapist (PT) Dr. Jas Randhawa who is the lead Performance Therapist at ALTIS. ALTIS is the most prominent Track & Field Performance centre in the world based out of Phoenix, Arizona. In May, I got to take the Performance Therapy Program at ALTIS. Dr. Jas was one of the lead performance therapists running the course. Dr. Jas is a great clinician who did great work with his patients at OHFAST. I was sad to hear that Dr. Jas would no longer be with us but I was happier to see him advancing forward and living his dreams. Great job Jas! You will always be a part of our family! I have know Dr. Randhawa for over 4 years and had the honour to work with him for 1.5 years. I knew Jas would be world class from early on. His passion for knowledge and to be better is second to none. He is and will be a leader in our profession for a long time. I'm honoured to know him and cherished his time at OHFAST. Great job Jas.